The essence of a book lies in the dialogue it establishes with its reader and the variable and durable images which it creates and leaves in the reader’s memory. 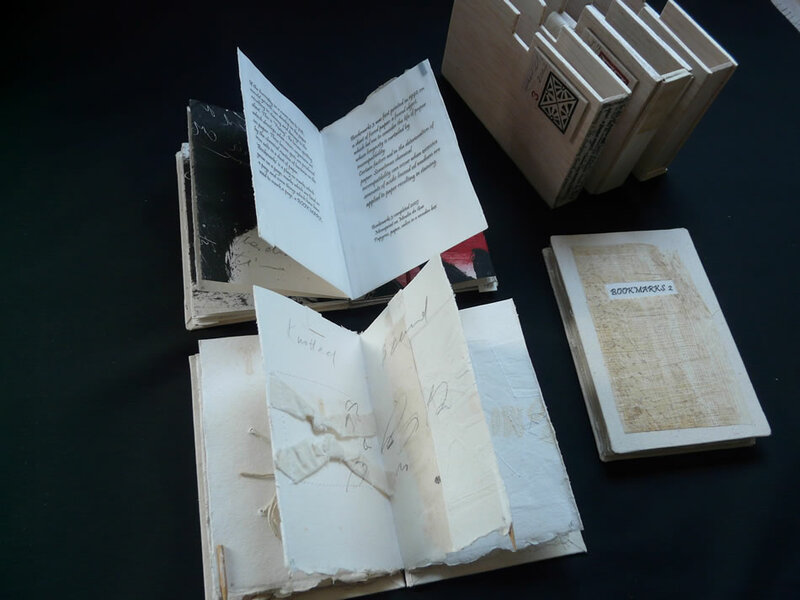 A book, and in particular an Artists Book is more than a series of verbal structures and images. It ‘…is a relationship, an axis of innumerable relationships’. - Jorge Luis Borges. 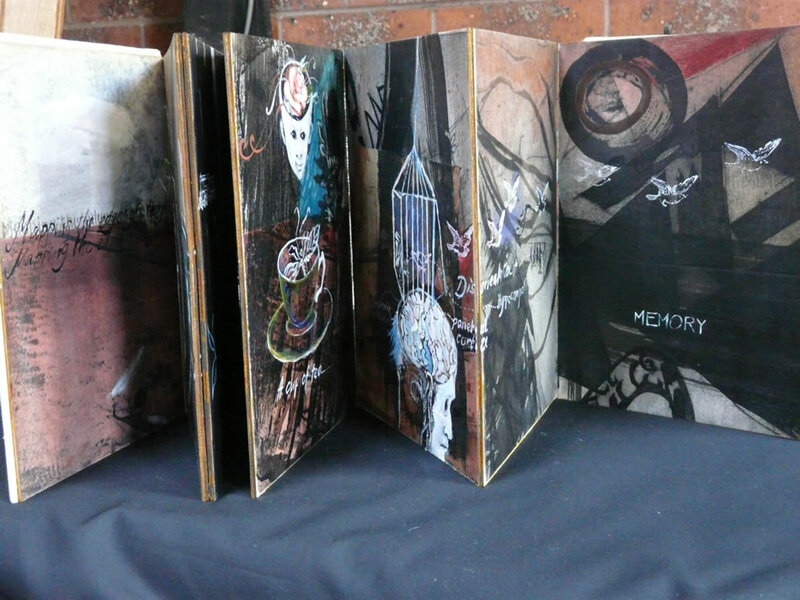 These Artists Books are created out of found objects. They are visual structures of prints paintings and collages based on incidents, conversations, quotations, travel diaries and my visual interpretation of certain encounters and experiences, bound together and related to memory. Click the images below to view larger reproductions. 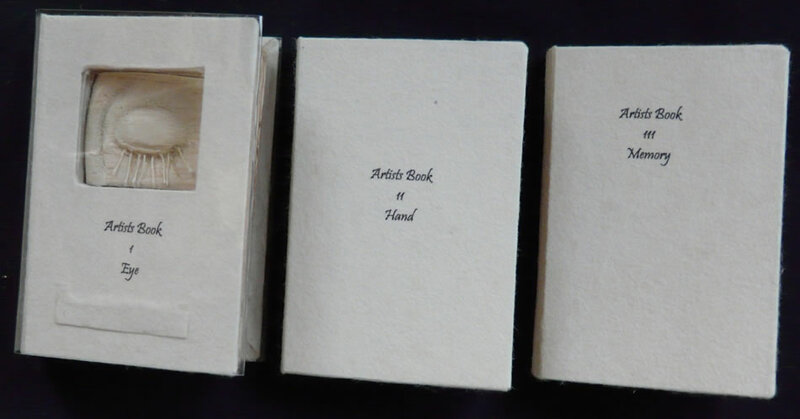 Bookmarks I, II & III are three cloth-bound books, each in a balsa wood slipcase. 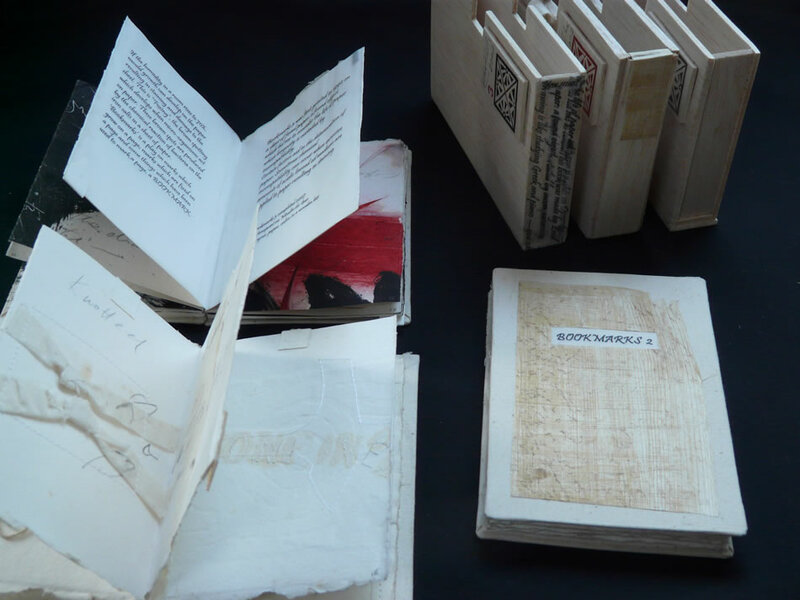 These books were created from a piece of found paper that had foxed over the years. 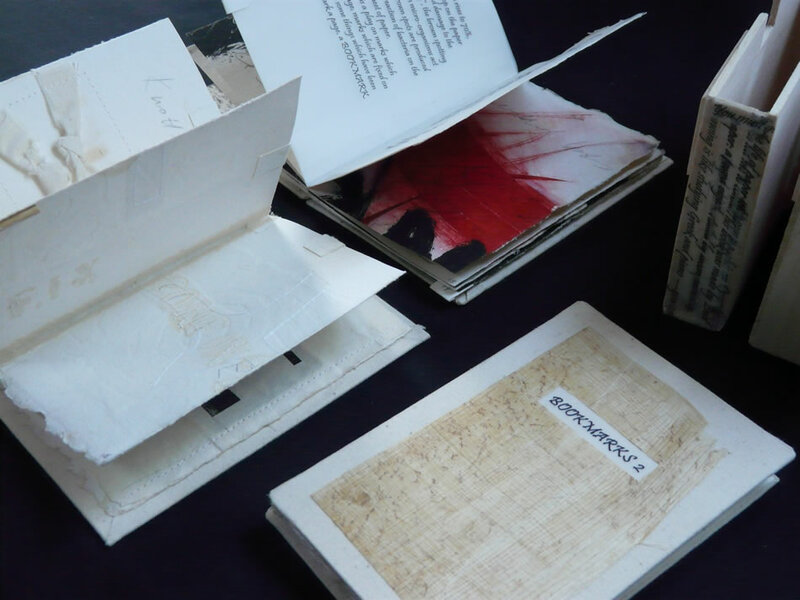 As it was once a beautiful piece of paper, it was ‘resurrected’ by being made into a book. The title is a play on the word ‘bookmark’. 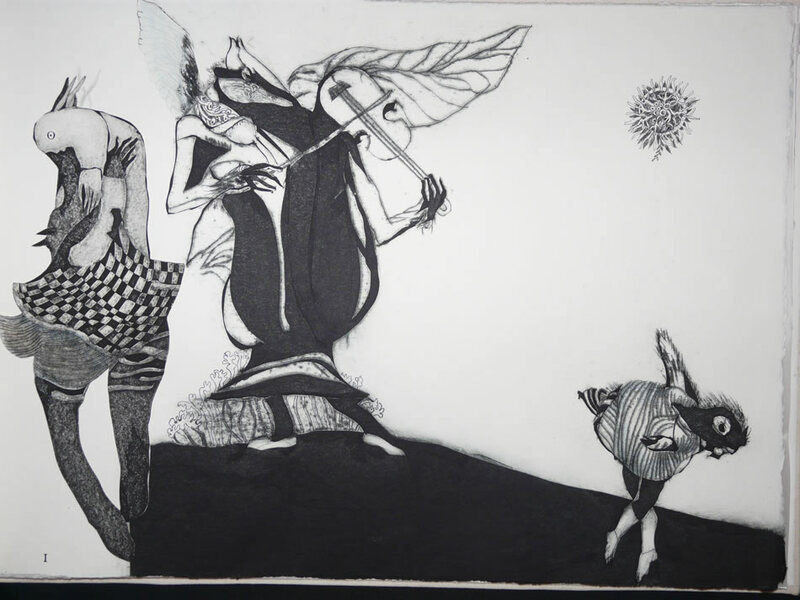 Mapping the Edges of the Night is a cloth-bound concertina book of drawings, rubber stamped images and paintings on paperdrypoint, etching and relief prints. This book concerns the loss of memory. It marks an encounter with a dementia sufferer. The images and text are from the book Mapping the Mind by Rita Carter. Notebook is a cloth-bound ‘notebook’ with pages made from scrap paper stitched and bound. 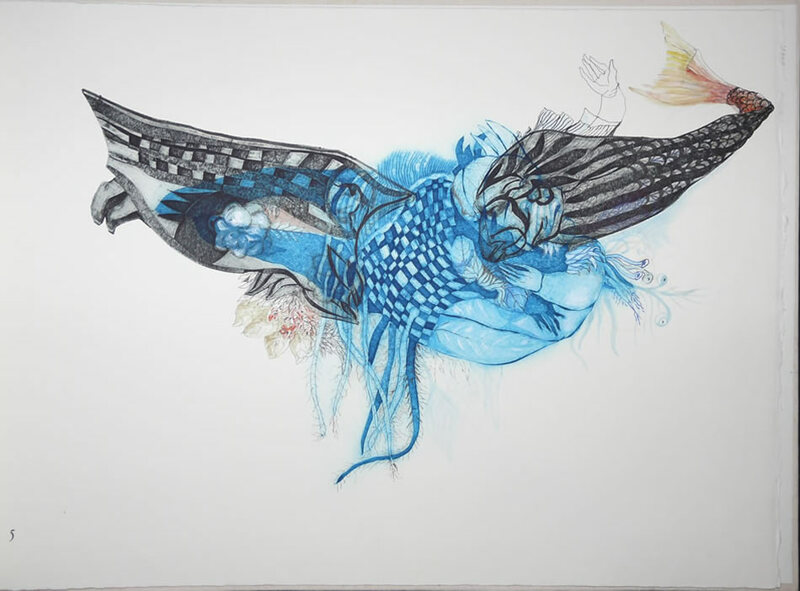 The drawings in ink and watercolour evolved from photographs and found objects. 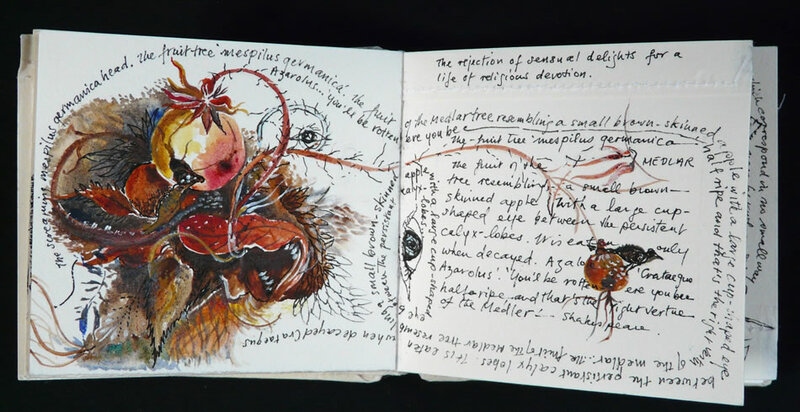 The notes on the ‘mespilius germanica’ were made after the discovery of a strange fruit found on a friend’s property in Narellen, NSW which closely resembled the ‘mespilius germanica’ in Bosch’s ‘St John the Baptist in the wilderness’. Many of the drawings in this book are inspired by this fantastically formed plant which is beside the saint in Bosch’s painting. There are also images of the Australian Frogmouth which were at first purely imaginary and later informed by photographs from a book on Owls. These images originated from news of a frogmouth owl sighted at a friend’s place in North Sydney. Dimensions: 11cm x 12cm x 2cm. 60 pages 2010. 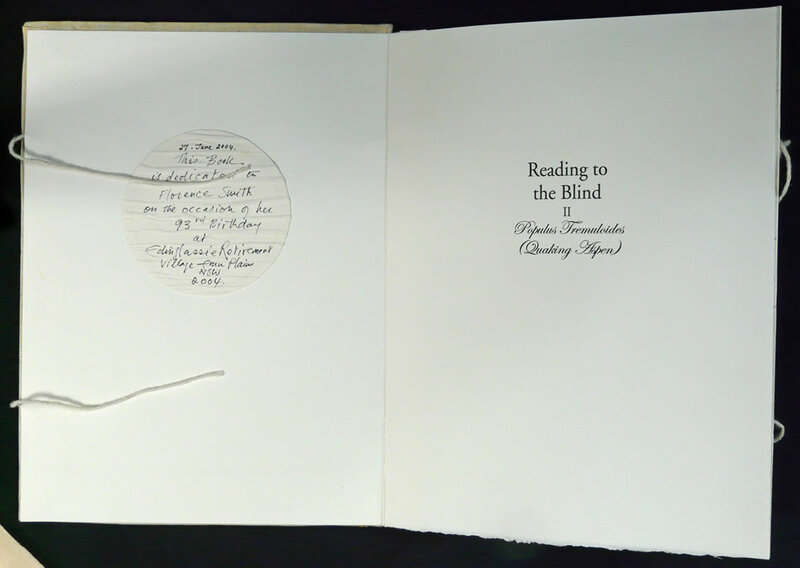 Reading to the Blind is a combination of collage and embossed prints with wood taken from a quaking aspen outside the retirement village at Emu Plains NSW. 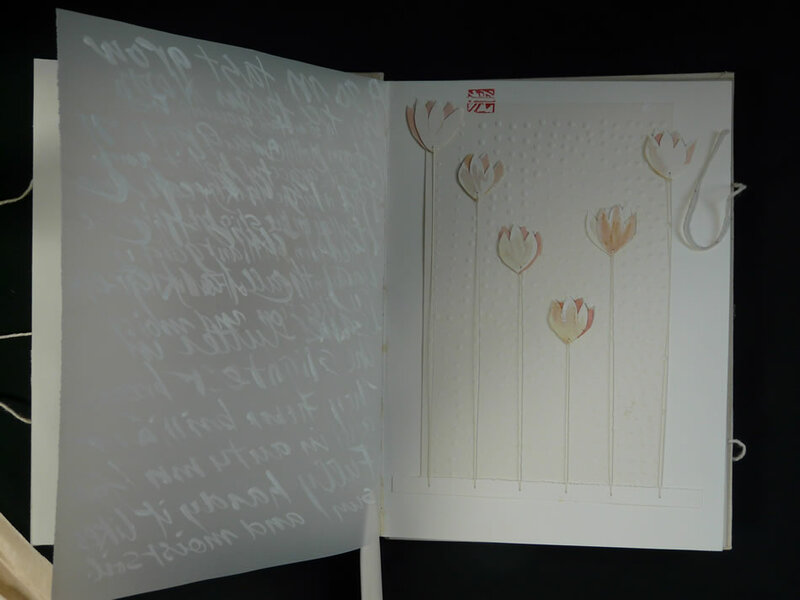 The cover bears the shoots and twigs from the quaking aspen and the word “open” embossed in braille. Throughout the book there are embossed marks. The text takes the form of a conversation with a sight impaired friend. 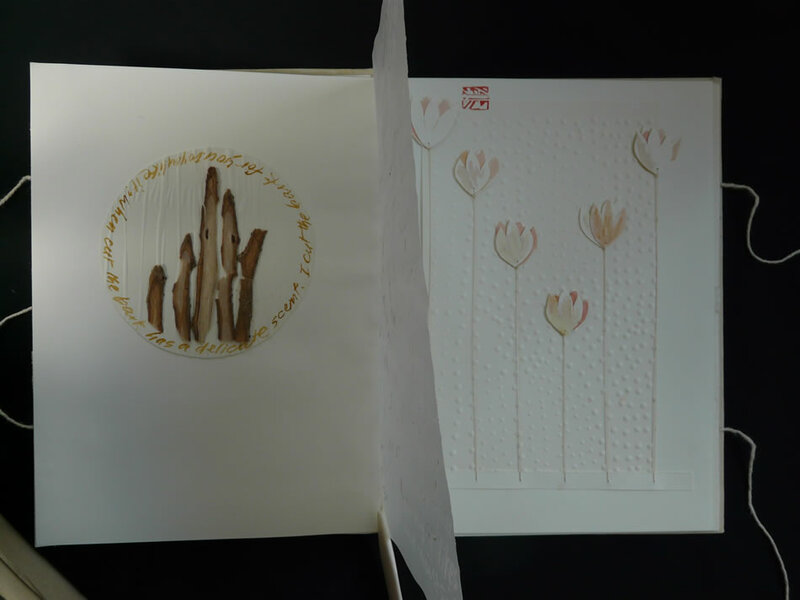 The concertina book is bound in calico and placed in a cardboard box with a clasp made from a quaking aspen twig. The Thief of Fire is inspired by the poem “Looks Like Meaning” by the Australian poet, Brook Emery. 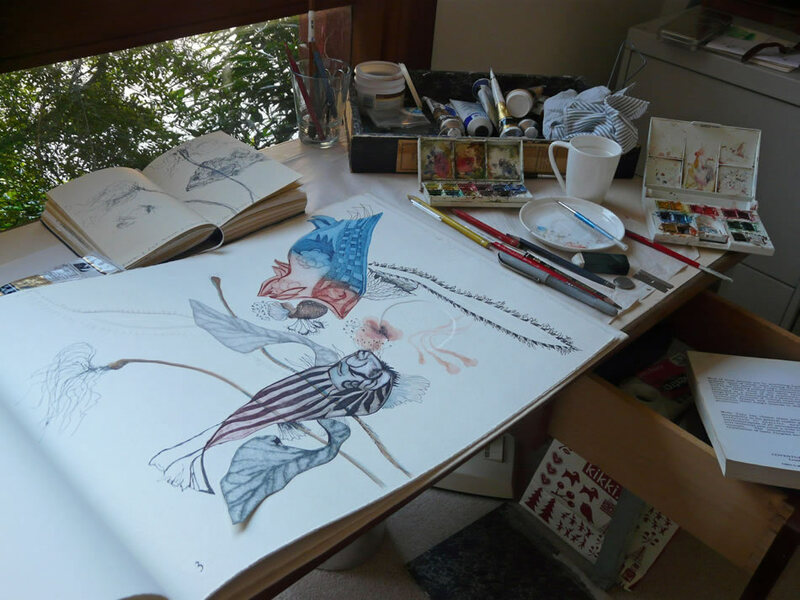 The watercolour, embossing, ink drawings and paperdrypoint prints in the book are based on drawings of marine life done at the Museum of Science and Humanities, San Francisco. 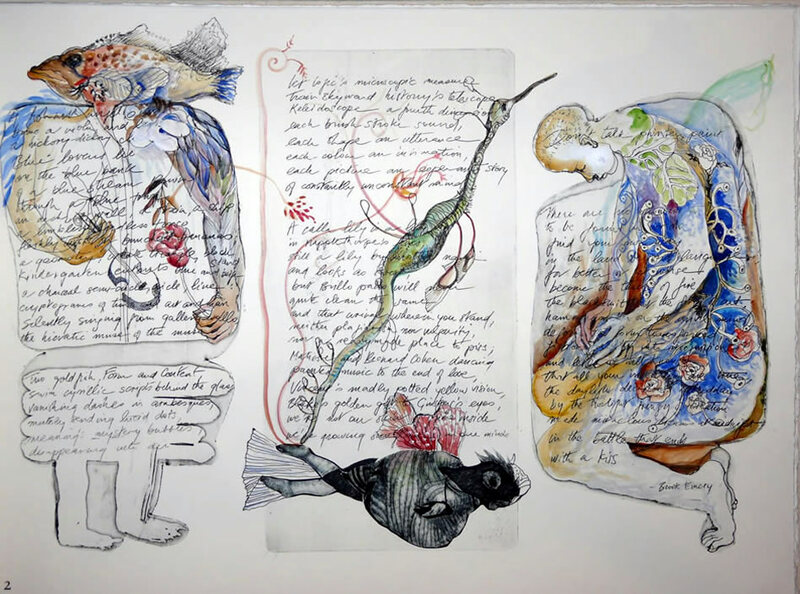 The text is the poem itself but the images are not an illustration of the poem but a series of free drawings and prints inspired by the first lines of the poem. Dimensions: 53cm x 36cm x 2cm. 5pages. 2007-2012. Select an image below to view larger reproductions.